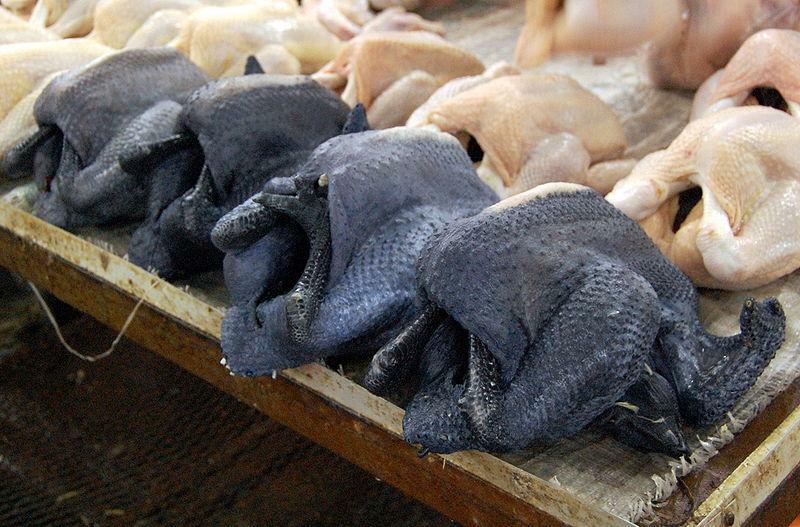 Silkies owe their unusual black color to fibromelanosis, a rare genetic mutation of hyperpigmentation believed to have first arisen in China. Their Mandarin name, wu gu ji , means “dark-boned chicken;” the name silkie comes from their fluffy plumage which, lacking barbicels, looks and feels like fur. Silkies have five toes, one more than other chicken breeds. According to the Chinese, the fascinating Silkie chicken, with its black skin, bones, and nearly black flesh, acts as an aphrodisiac. In the West, however, these beautifully colored chickens are popping up more in the butcher shop and are perhaps one of nature’s most captivating examples of this genetic anomaly. Hyperpigmentation is a harmless condition that causes skin to become darker in color than the normal surrounding skin and is caused by an excess of melanin. In humans, hyperpigmentation commonly manifests in darker patches, but for the Silkie chicken, the hyperpigmentation further evolved into something called fibromelanosis. This causes nearly everything, aside from their plumes, to be black. Native to South China (Marco Polo is said to have seen them in his travels) and surrounding areas, the West came of know of these fine chickens in the late 1500’s, when publishers began to print of history and medicinal values of the various foods and herbs of the Dynasties. Chinese folklore includes celestial attention to the Silkie when the white birds gained immortality by consuming Lu Dongbing’s pills from his pond in 798 A.D. on the Wushan Mountain of Taihe, and were transformed into white phoenix. Tradition remains strong, and the use of the Silkie is very common today throughout the world. Call for Available Silkie Cut Details. Duck farming has changed radically from the days of herding ducks in fields. From animal husbandry techniques, to modern hatcheries and feed processes, duck farming has become an exacting science. Providing all natural ducks, bred specifically for the finest flavor, weight and skin available has been the passion of a handful of Pennsylvania farms for over three decades. 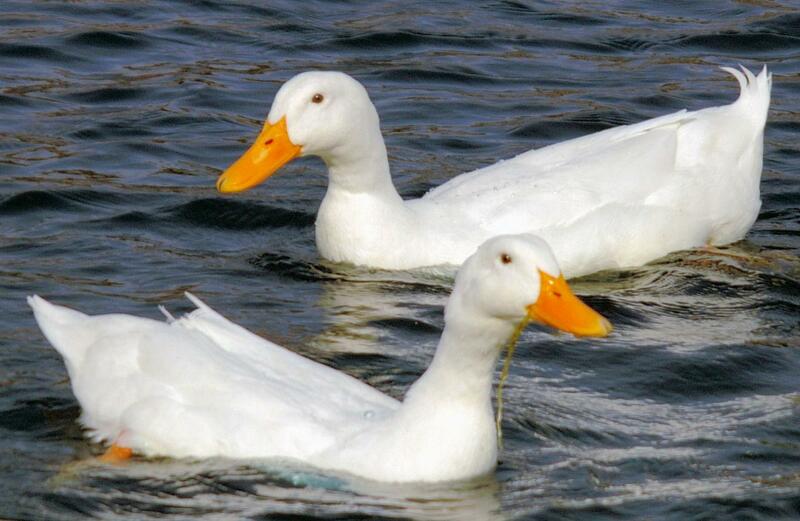 Coupled with air chilling techniques that significantly reduces food safety hazards, Duck production has reached its highest form. Air chilling has become a favored method of bringing the temperature down after dressing. This process is also more effective in tenderizing the meat. Since the ducks do not depend on ice water for chilling, the duck’s natural juices are not diluted in, or replaced by the water in a conventional water chiller. SeafoodS.com offers these Ducks year-round and guarantees that the quality stands against other nationally distributed birds. Our producers are committed to supplying Duck that not only warrants culinary celebration, but also adheres to farming practices that celebrate environmental stewardship. Check out our full list of Duck cuts available attached in the red link below. For unexplained reasons, Europeans, particularly north Europeans, have always been fond of goose, whereas in North America the popularity of this fowl is more or less concentrated on Christmas and New Year’s Eve. Goose meat is darker (including the breast), fuller bodied, and more intensely flavored than turkey. It is fatter and has more depth of flavor than duck. Of all fowl, goose meat offers the most opportunities to match with various wines. Today’s Geese still have a whiff of gaminess, but just enough to appeal to the connoisseur. There is no need to tenderize chemically or mechanically as feeding and raising techniques have improved. Commodity Turkey has been crossbred to the extent that its meat is more or less mushy; the birds are fed with inferior manufactured feed. 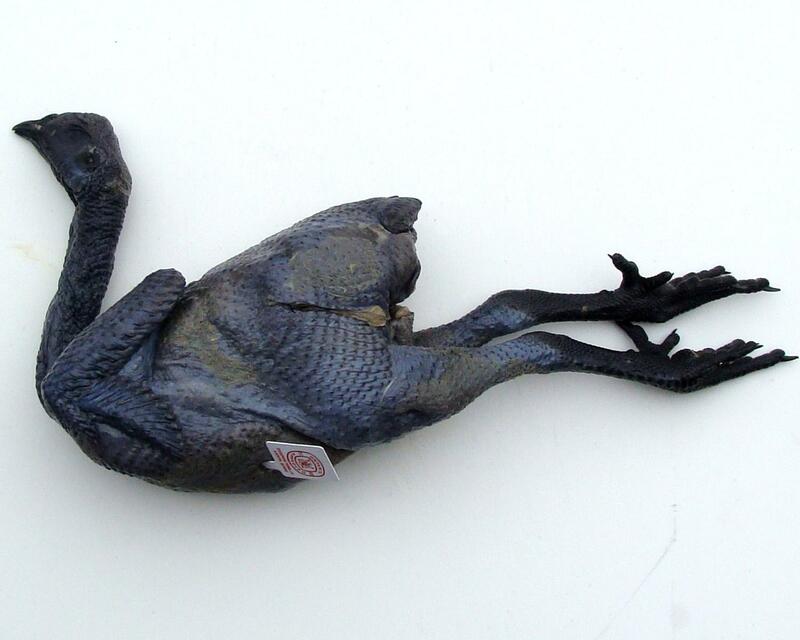 Geese have been spared this fate, because unlike turkeys, crossbreeding geese is much more difficult. The natural cycle of raising geese is still in tact: hatching, between April and July, forage feeding paired with high quality supplemental grain, and slaughter in September produces one of the highest quality Goose on the market. These are true “Free Range birds. They are grown entirely outdoors. 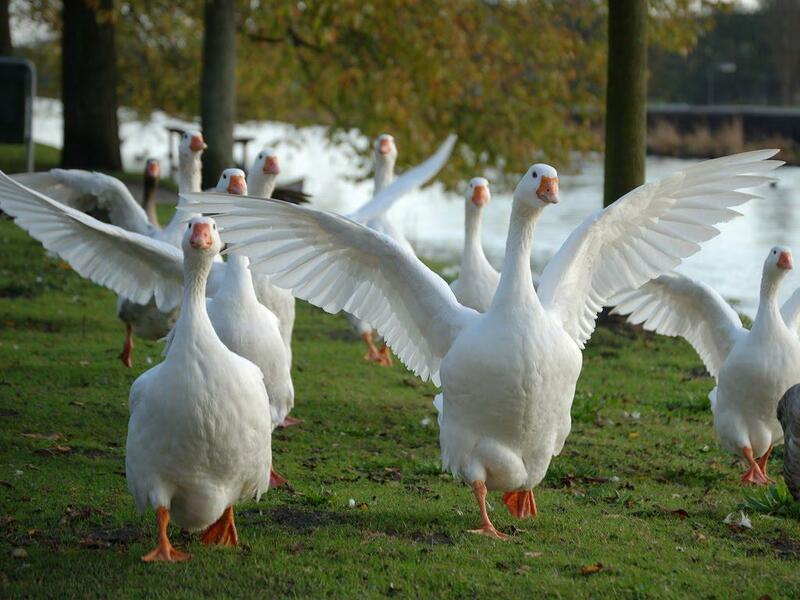 Raising Geese in the most natural way, our producer supplies SeafoodS.com with one of the most sustainable birds on the market. We have partnered with the largest USDA Certified Organic farm in the Southeast. The animals are processed in USDA Inspected abattoirs that was built there on their farm, and they are zero-waste facilities. All animal remains are processed in their on-site aerobic/anaerobic “digester” and used as organic fertilizers for their pastures. They have a small-scale Certified Organic farm on the property that grows more than 40 varieties of heritage vegetables, fruits and nuts. Twenty percent of their plant’s energy needs comes from solar panels. Our producer received the Governor’s Award for Environmental Stewardship in 2011, The University of Georgia’s Award of Excellence in 2008, named the Most Respected Business Leader in Georgia and received the Growing Green Award in 2014. Categories: MENU PLANNING, PRODUCT KNOWLEDGE | Tags: all natural, Black Chicken, Chef, Chicken, Duck, Executive Chef, Fowl, free range, Game, Geese, Goose, Hotel, Pastured, Poultry, resort, Restaurant, restaurant menu, Seafood Chef, Seafood Restaurant, Silkie, silky, Sous Chef | Permalink.